Ugh! It was a terrible week for the HLHB Trend-Catcher as it caught numerous fakeouts. Specifically, it took home a grand total of five losing trades but only one winning trade. At the end of the week, the system was down by 79 pips. Ouch. Below is the list of all the signals that materialized as well as their corresponding results. 1. 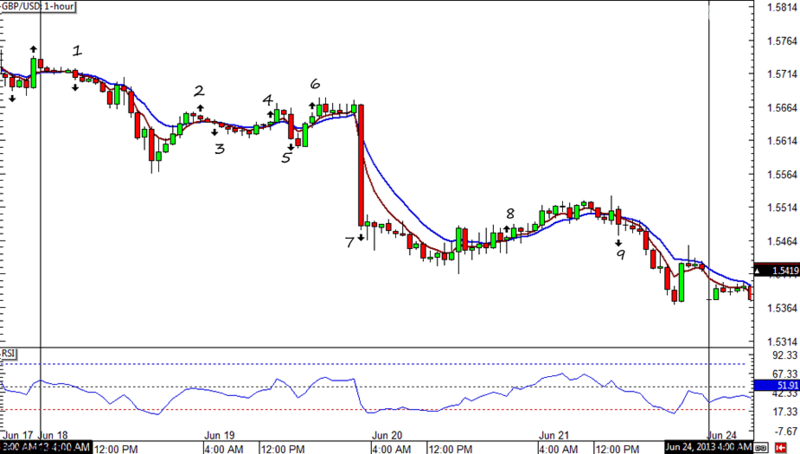 Invalid short signal since RSI was already below 50.0 prior the signal. 2. Invalid long signal. RSI was below 50.0. 3. Short at 1.3332. Closed at 1.3377 when 50-pip trailing stop was hit. -45 pips. 4. Long at 1.3380. Closed at 1.3348 due to a new crossover. -32 pips. 5. Short at 1.3348. Closed at 1.3374 due to a new crossover. -26 pips. 6. Long at 1.3374. Closed at 1.3350 when 50-pip trailing stop was hit. -24 pips. 7. Short at 1.3388. Closed at 1.3401 due to a new crossover. -13 pips. 8. Invalid long signal. RSI was already above 50.0 prior the signal. 9. Invalid short signal. RSI was above 50.0. 10. Invalid long signal. RSI was already above 50.0 prior the signal. 11. Short at 1.3272. Closed at 1.3211 when 50-pip trailing stop was hit. +61 pips. 12. Invalid long signal. RSI was below 50.0. 13. Invalid short signal. RSI was already below 50.0 prior the signal. 1. Short at 1.5708. Closed at 1.5614 when 50-pip trailing stop was hit. +94 pips. 2. Invalid long signal since RSI was below 50.0. 3. 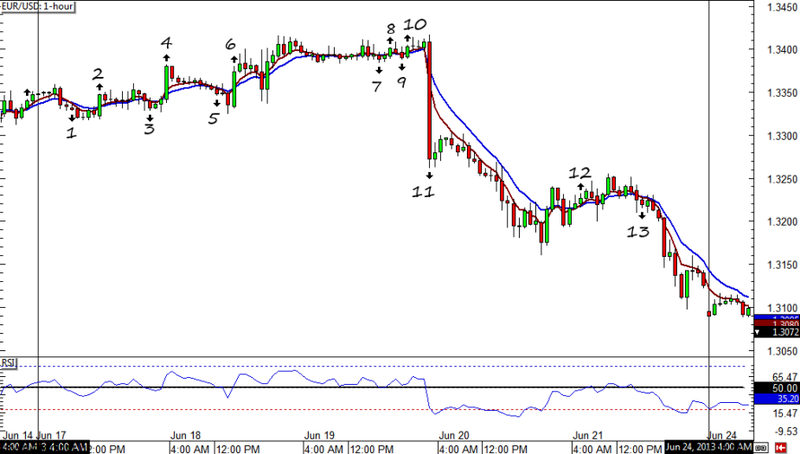 Invalid short signal since RSI was already below 50.0 prior the signal. 4. Invalid long signal since RSI was below 50.0. 5. Short at 1.5617. Closed at 1.5650 due to a new crossover. -33 pips. 6. Long at 1.5650. Closed at 1.5628 when 50-pip trailing stop was hit. -22 pips. 7. Short at 1.5487. Closed at 1.5468 due to a new crossover. -19 pips. 8. Invalid long signal since RSI was below 50.0. 9.Short at 1.5488. Closed at 1.5418 when 50-pip trailing stop was hit. +70 pips.